Quick Reminder: Pizza isn't allowed during the Lurong 2016 Championship Challenge, but you can reward yourself with a slice when it's over in October. Registration for the Challenge opens at 2PM on August 1st, and there are early bird prizes for the first 175 people to register, plus Box prizes based on number of entries, so set your alarm and get in on this early. This is a fun Challenge and a great way to hit the reset button after a long summer of eating chocolate covered crickets, or what have you. So, you’ve completed weeks and weeks of food journals on the recent Challenge, or you’ve already adopted a 100% Paleo diet, or maybe you’ve just figured out the right combination of fuels to feed your body to keep yourself fit. So how does pizza fit into any of these equations? Simple. Planning to eat a cheat meal like pizza can help you stick to your healthy eating lifestyle. Think about it. As Americans, we’re subjected to the daily bombardment of advertisements for sugary cereals, tasty dollar menus, drive up feed bag delivery, and countless other unhealthy choices being pushed on us as a result of our country’s generally horrible eating practices. You really need to work at it to eat healthy. That means meal planning and prep, going out of your way to buy healthier foods, having a salad while your co-workers stuff their faces with sandwiches and pasta, and bringing meals with you to work or school. It’s quite a struggle when the foods that are the worst for us are the easiest to obtain, and all the work that goes into eating right can wear you down. So how do you stay true to your healthy eating style long-term? You plan to cheat. A pre-planned cheat meal will help break up the monotony of the weighing and cooking and planning, and help you keep to your ultimate goal of sticking with your eating plan. A recent study in Portugal, as reported by Men’s Health, supports this. In the study, two groups of participants were placed on a reduced calorie diet. One group had to strictly stick to the prescribed diet. The second group did the same, but was allowed to eat whatever they wanted on Sundays. At the end of the study, both groups had reduced their overall body mass index. There was no significant difference in the amount of weight the two groups lost, but the group that was allowed to cheat on Sundays was happier and more motivated to continue working towards their weight loss goals. The study supported the thought that if you feel happy about your eating habits and are still seeing results, you are more likely to stick with that healthy eating plan. Treat the cheat as a reward for eating right. If you didn’t stick to your plan that week, you get no reward. Now, a pre-planned cheat meal is different than a spur of the moment decision to hit Dunkin’ Donuts on your way in to work. Detours like that will quickly derail your healthy diet. You need to plan to cheat like you plan to work out or plan to get your teeth cleaned. Put it on a calendar if you need to. Scheduled cheats will help you stay true to your healthy eating lifestyle. Note that even though the study participants were allowed the whole day to eat whatever they wanted, that is probably not the best idea to maintain a long term healthy eating style and that is not ideal if your goal is to lose weight. 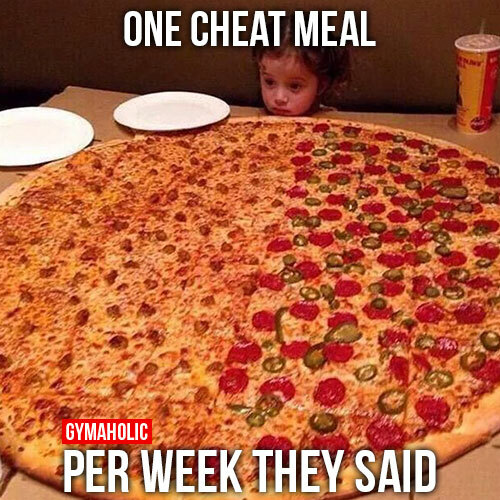 A single cheat meal once during the week is better. And, if you do cheat, be careful not to turn it into a binge meal, or worse, a binge day. Reward yourself for sticking to your diet with a single indulgence, but keep it within reason. Have a slice or two of pizza, or an ice cream cone, not the whole pie or whole gallon. If you can plan the cheat meal for immediately following a workout, that would be ideal since you’ll likely burn up most of the calories during your recovery anyway. Work out hard, eat right, and plan to reward yourself for doing so. That is how you can stay on track to a healthy lifestyle.